Why sacrifice features for value? 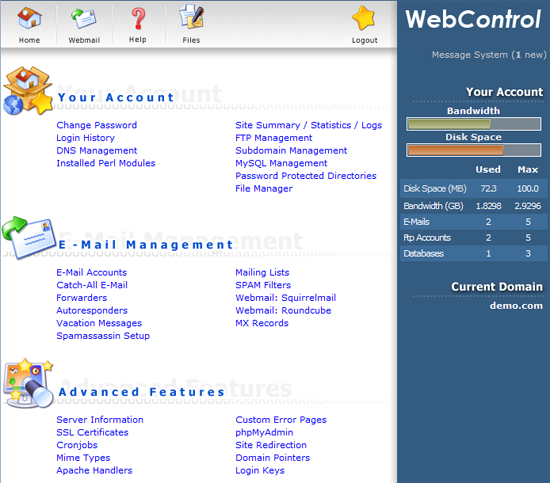 WebControl gives you full control of your hosting 24 hours a day. Our free package will run most sites. Basic and premium packages suit large or business level sites. Pricing is yearly and works out to only pennies per day. Installatron is now included in all packages! Install the most popular apps in under a minute. Websites, blogs, galleries and more, click to see over 130 apps. How easy is Installatron? Try the demo. We have a hosting plan to meet your needs. If you are new to hosting try the FREE option. The Budget plan is full featured and costs only pennies a day. The premium package is perfect for highly active sites , offering a huge traffic volume and plenty of email address.